Your team's code review practices cause ripple effects far into the future. In this play, see several ways a single code review can go, then fast-forward and rewind to see the effects -- on codebase and culture -- of different code review approaches. The setting: an office conference room. The characters: a developer, who's written a chunk of new Ruby code, and a team lead, who's about to review it. The code is not great. I've been doing a lot of theater-inflected conference presentations recently. I came up with the ideas for "Code Review, Forwards and Back" and "Lessons, Myths, and Lenses: What I Wish I'd Known in 1998" and "Python Grab Bag: A Set of Short Plays" (more details on all of these on my Talks page). In some sense this is unsurprising, as I'm a programmer and public speaker who has dabbled in the more creative performing arts my whole life. As a child I had small parts in school* and community** theater, and my sister and I wrote and performed in some number of long skits for Indian-American association get-togethers (there was a lot of No Big Deal family-based practice here, as with writing and public speaking in general). I have also been willing to sing in public really quite out of proportion to my actual singing ability for a very long time. And I got all right at stand-up comedy and at comedy auctioneering. *** So I have started to bring those skills into my conference presentations, and am interested in how spectacle, fictional narrative, and different presentation formats can make different kinds of teaching and representation possible. Someone else thinking about the value of storytelling in conference talks is Maria Farrell, who posted at Crooked Timber about that and about "think-tank fiction" (fictional stories/scenarios, sometimes composites of real situations and sometimes future projections, reflecting on and demonstrating the effects of particular policies and trends). I hope Farrell can come to ! !Con or a similar event sometime, to see how it nurtures some similar experiences. Fred, people have been telling each other stories since we were hominids around campfires in Africa. It’s a very basic human cognition thing, really. My colleague Erik Möller did a talk like the ones Farrell mentions at Wikimania 2013, "Ghosts of Wikis Yet to Come: Three Stories of Wikimedia's Future". And I think Tom Scott's scifi shorts and story-style talks, and the "Slaughterbots" video from Ban Lethal Autonomous Weapons, are worth checking out as exemplars. * Not always onstage -- the first bit of project management I ever did was stage management. I fuzzily remember running a puppet show in elementary school, and officiously checking off attendance using a clipboard (oh how important I felt!) for some middle school thing. ** Perhaps most memorably: Rudy, Rudolph the Red-Nosed Reindeer's nerdy little sister, in "The Night Before The Night Before Christmas" at a local YW/MCA. I actually had lines in this role! To demonstrate Rudy's bookishness, the script had her say aloud, apropos of nothing, "O is for oxygen," "N is for nitrogen," "C is for carbon", and so on. In retrospect this dialogue has more verismilitude than I would like to admit. *** And of course this feels completely normal to me, because, you know, you only have your own one life, and your own life has a way of becoming the yardstick rather than the judged. But a great swathe of programmers and other technologists don't think of writing or putting on or starring in a small play as No Big Deal. Many haven't ever memorized lines. And sometimes I forget that, if you've taken a storytelling workshop and served as a dramaturg for someone's one-woman show, and you're a programmer who gets to speak at conferences like PyCon and FOSDEM, you're unusual. Your intersection of skillsets is rare. And one of the intuitions that's helped me develop my career is that I can provide unique value where the intersection of my skillsets is rare. # 29 Jul 2018, 03:02PM: "Python Grab Bag: A Set of Short Plays" Accepted for PyGotham 2018: Fresh from the waitlist onto the schedule: Jason Owen and I will be performing "Python Grab Bag: A Set of Short Plays" at PyGotham in early October. If you want to come see us perform, you should probably register soon. I don't yet know whether we'll perform on Friday, Oct. 5 or Saturday, Oct. 6. A frenetic combination of educational and entertaining segments, as chosen by the audience! In between segments, audience members will shout out numbers from a menu, and we'll perform the selected segment. It may be a short monologue, it may be a play, it may be a physical demo, or it may be a tiny traditional conference talk. Audience members should walk away with some additional understanding of the history of Python, knowledge of some tools and libraries available in the Python ecosystem, and some Python-related amusement. So now Jason and I just have to find a director, write and memorize and rehearse and block probably 15-20 Python-related plays/songs?/dances?/presentations, acquire and set up some number of props, figure out lights and sound and visuals, possibly recruit volunteers to join us for a few bits, run some preview performances to see whether the lessons and jokes land, and perform our opening (also closing) performance. In 68 days. Jason, thank you for the way your eyes lit up on the way back from PyCon when I mentioned this PyGotham session idea -- I think your enthusiasm will energize me when I'm feeling overwhelmed by the ambition of this project, and I predict I'll reciprocate the favor! PyGotham program committee & voters, thank you for your vote of confidence. Leonard, thanks in advance for your patience with me bouncing out of bed to write down a new idea, and probably running many painfully bad concepts past you. Future Sumana, it's gonna be ok. It will, possibly, be great. You're going to give that audience an experience they've never had before. # 29 Jun 2018, 08:06AM PST: Open Source Bridge: I'll be at the last Open Source Bridge today (in fact, Changeset Consulting is a sponsor), in case you want to wave hi. # 12 Mar 2018, 03:21PM: Request: Donate To the Tiptree Award Auction: The James Tiptree, Jr. Literary Award encourages the exploration & expansion of gender, and holds a fundraising auction at WisCon each year. I'm the auctioneer, which is a pretty fun form of community service, and serve on the Tiptree Motherboard. We're seeking donations of objects to be auctioned -- handcrafts, books, memorabilia, games, and art, especially with scifi/fantasy or feminist elements, are welcome. Art commissions, e.g., "I will draw a portrait of you"
Some items I'll auction live from the stage. Some, people will buy directly from a cashier, at the Gathering on Friday afternoon or from the Direct Sale table at the auction. Some, folks will bid on via a silent auction throughout the con. And a few, we'll auction online. I wrote last year about what an award does, and the reflections I've seen from winners of the Tiptree Awards and Fellowships tell me those honors are doing the job -- encouraging creators and fans to expand how we imagine gender -- and by donating to the auction, you're supporting that. The auction will be Saturday night, May 26th, and will be about 90 minutes long. If you want to come and you're local to Madison, you can buy a day pass at the door (just to attend WisCon on Saturday) for about $25. And it's totally fine to come to the auction just to enjoy the show, and not to buy anything. Please feel free to signal-boost this, and if you're donating please fill out the form by May 15th. Thank you. # 02 Jan 2018, 10:46AM: 2017 Sumana In Review: Four years ago, during my first batch at the Recurse Center, every day I'd write in a little notebook on the subway on my way home, jotting down a few bullet points about what I had learned that day. I found it helped in a variety of ways, and the keenest was that on bad days, reviewing my notes reminded me that I was in fact progressing and learning things. On any given day in 2017 I often did not feel very happy with my progress and achievements and how I was using my time. I fell ill a lot and I was heartsick at the national political scene and current events. It is genuinely surprising to me to look back and take stock of how it all added up. I went hiking in Staten Island and in the Hudson Valley. I got back on my bike and had some long rides, including on a canal towpath in New Jersey and over the Queensboro bridge. (And had my first accident -- a car in my neighborhood rear-ending me at a traffic light -- and thankfully escaped without damage or injury.) I learned how to bake bread. I got to meet Ellen Ullman OMG. And I tried to travel less than I had in previous years, but I still had some fine times in other places -- notably, I had a great time in Cleveland, I witnessed the total solar eclipse in Nashville, and I visited Charlotte, North Carolina (where, among other things, I visited the NASCAR Hall of Fame). I did some of the same kinds of volunteering and activism that I'd done in previous years. For instance, I continued to co-organize MergeSort, participated in a fundraising telethon for The Recompiler telethon, signal-boosted a friend's research project to get more participants, and helped revitalize a book review community focusing on writers of color. Also, I served again as the auctioneer for the James Tiptree, Jr. Literary Award fundraising auction at WisCon, which is a particularly fun form of community service. The Tiptree Award encourages the exploration & expansion of gender. I wrote this year about what an award does, and the reflections I've seen from winners of the Tiptree Awards and Fellowships tell me those honors are doing the job -- encouraging creators and fans to expand how we imagine gender. This year I also deepened my commitment to the Tiptree Award by accepting the organization's invitation to join the Tiptree Motherboard; I am pleased to have helped the award through a donation matching campaign. But the big change in my community service this year was that I tried to prioritize in-person political work. I called, emailed, and wrote postcards to various government officials. I participated in my local Democratic Club, including going door-to-door petitioning to get my local city councilmember onto the ballot for reelection. And I found that I could usefully bring my technologist perspective to bear on the city and state levels, especially regarding transparency in government software. I spoke to my local councilmember about my concern regarding public access defibrillator data (the topic that led me to file my first-ever Freedom of Information Law requests, for government health department records) and this inspired him to sponsor a bill on that topic. (Which is now filed as end-of-session partly because of the limbo in potentially getting PAD data from NYC's open data portal -- I need to send an email or two.) 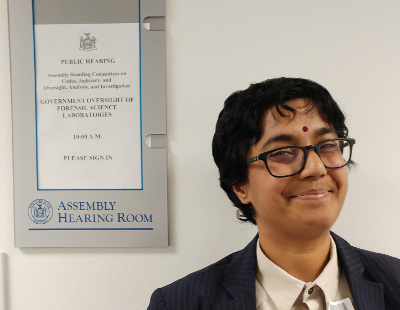 I was invited to speak to a joint committee of the New York State Assembly on the software side of our forensics labs, and got particularly interested in this aspect of due process in our criminal justice system, publicizing the issue in my MetaFilter posts "'maybe we should throw an exception here??'" and "California v. Johnson". I testified before the Committee on Technology of the New York City Council on amendments to our open data law (I didn't prep my public comment, so this text is reconstructed from memory; video), and then spoke before the same committee on an algorithmic accountability measure (and publicized the bill, especially keeping the Recurse Center community apprised as best I could). And I did research and outreach to help ensure that a state legislature hearing on protecting the integrity of our elections included a few researchers and activists it wouldn't have otherwise. In 2018 I want to continue on this path. I think I'm, if not making a difference, making headway towards a future where I can make a difference. This was by far Changeset Consulting's busiest year. I had a mix of big projects and smaller engagements. First, some of the latter: I advised PokitDok on developer engagement, with help from Heidi Waterhouse. For Open Tech Strategies, I wrote an installation audit for StreetCRM. And, working with CourageIT, I came in as a part-time project manager on a government health IT open source project so the lead developer could focus more on architecture, code, and product management. Following a sprint with OpenNews in December 2016 to help write a guide to newsrooms who want to open source their code, I worked with Frances Hocutt to create a language-agnostic, general-purpose linter tool to accompany that guide. "The Open Project Linter is an automated checklist that new (or experienced but forgetful) open source maintainers can use to make sure that they're using good practices in their documentation, code, and project resources." I spent much of the first half of 2017 contracting with Kandra Labs to grow the Zulip community, helping plan and run the PyCon sprint and co-staffing our PyCon and OSCON booths, running English tutoring sessions alongside Google Summer of Code application prep, and mentoring an Outreachy intern, along with the usual bug triage, documentation updates, and so on. We wrapped up my work as Zulip's now such a thriving community that my help isn't as needed! From late 2016 into 2017, I've continued to improve infrastructure and documentation for a Provider Screening Module that US states will be able to use to administer Medicaid better (the project which spurred this post about learning to get around in Java). Along the way, I've gotten a little or a lot better at a lot of things: git, bash, LaTeX, Python (including packaging), Sphinx, Read the Docs, Pandoc, regular expressions, CSS, the Java ecosystem (especially Gradle, Javadocs, Drools), the Go ecosystem, Travis CI, GitHub Pages, Postgres, sed, npm Linux system administration accessibility standards, IRC bots, and invoicing. This year, in retrospect, instead of doing technical talks and expository lectures of the type I'm already good at, I played with form. At LibrePlanet 2017 I gave the closing keynote address, "Lessons, Myths, and Lenses: What I Wish I'd Known in 1998" (schedule, video, in-progress transcript). I tried something aleatoric and it worked pretty well. At Penguicon 2017 I was one of several Guests of Honor, and spoke in several sessions including "Things I Wish I'd Known About Open Source in 1998" (which was different from the LibrePlanet version, as intended) and "What If Free and Open Source Software Were More Like Fandom?" (further links). Then, at PyGotham, Jason Owen and I co-wrote and co-starred in a play about management and code review: "Code Review, Forwards and Back" (video on YouTube, video on PyVideo, commentary). 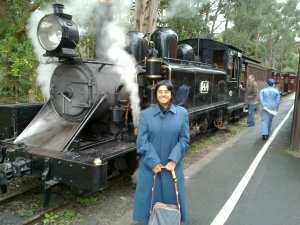 I also attended Maintainerati and led a session, attended ! !Con, worked a booth for Zulip at OSCON, attended PyCon and helped run Zulip's sprint there, and co-sponsored a post-PyGotham dinner. I did not write this year for magazines; my writing went into this blog, MetaFilter, Dreamwidth, microblogging, and client projects, mostly. I also wrote an entry for a local business competition (I didn't make it very far but I'm glad I did it, especially the finance bits) and started two book proposals I would like to return to in 2018. "Inclusive-Or: Hospitality in Bug Tracking", a response to Jillian C. York and Lindsey Kuper. I turned part of "Some posts from the last year on inclusion" into "Distinguishing character assassination from accountability", a post about pile-on culture and callout culture where I pulled out quotes from 11 writers on how we take/charge each other with responsibility/power within communities. I loved Jon Bois's 17776 and discussed it with other fans on MetaFilter, and then, to try to understand its amazingness better, wrote "Boisebration", collecting links to fiction and nonfiction by Bois about class, feminism, aging, sports, politics, wonder, education, & art (and 17776 precursors/callbacks). I found out about Robert E. Kelly, like so many did, when his kids crashed his BBC interview, then collected some links in a MetaFilter post about his writing on Korea, US foreign policy, international relations, and academia. I wrote up a bit about "1967's most annoying question for women in Catholic ministry" on MetaFilter to signal-boost another Recurser's cool project. I enjoyed the learning and the plot twist in "The programmer experience: redundancy edition", in which I discovered a useful resource for Form 990 filings and learned to use the Arrow library for Python date-time manipulation. And was grateful to Pro Publica. yesterday, was trying to explain virtual environments/containers/VMs to a friend and said "they range from Inception-style fake computers to putting a blanket on the floor and pretending it's lava"
I got some public attention in 2017 -- even beyond the Guest of Honor and keynote speaker honors and my amazing clients -- that I would like to list, as long as I'm taking an inventory of 2017. I rode the first revenue ride of the new Q train extension in Manhattan and really loved the art at the new 72nd Street MTA stop. A journalist interviewed me about that on video and my experience got into the New York Times story about the opening. Presenters at the code4lib conference said their project was specifically motivated by my code4lib 2014 keynote "User Experience is a Social Justice Issue" (written version, video). I was honored and humbled. And -- this is out of place but I need to record it -- as someone who knew Aaron Swartz, I consented to be interviewed by artists working on a play about him, and so someone briefly portrayed me (as in, pretended to be me and repeated my words aloud) in that play, Building a Real Boy. Finally, Hari Kondabolu looked at the English Wikipedia page about him, much of which I contributed, and was amazed at how thorough it was. So that was awesome and I was proud. I got on Mastodon as part of my effort to improve how I use social media. I started using a new task tracker. I got back on my bike, and got somewhat into a habit of using it for some exercise and intra-city travel. A new friend got me into taking more frequent photos and noticing the world I'm in. Two new friends caused me to look for more opportunities to see musicians I love perform live. I consumed a fair bit of media this year; didn't get into new music but enjoyed music podcasts "I Only Listen To The Mountain Goats" and "Our Debut Album". I did some book and reading reviews and will catch up to other 2017 reading sometime vaguely soon. Leonard's film roundups & TV spotlights are a good way to see or remember most of what I saw in the last few years. TV highlights for me for 2017 are The Good Place, Jane the Virgin, The Great British Baking Show (which led me to write a tiny Asimov fanfic), Steven Universe, and Better Call Saul; I also saw Comrade Detective and Yuri!!! On Ice. Films I'm really glad I saw: The Big Sick, Schindler's List, Get Out (I fanned in MetaFilter Fanfare), In Transit, A Man For All Seasons, Hidden Figures, and Lemonade -- and a rewatch of Antitrust. I made a few new friends this year, most notably Jason Owen and Mike Pirnat. My friends Emily and Kris got married and I got to hold up part of the chuppah for them. I took care of some friends at hard times, like accompanying them to doctor's visits. I got to see some friends I rarely see, like Mel Chua and Zed Lopez and Zack Weinberg, and kept up some old friendships by phone. My marriage is better than ever. # 02 Oct 2017, 04:45PM: Code Review, Forwards And Back: This Friday, at PyGotham, Jason Owen and I are co-presenting "Code Review, Forwards and Back". This is not a standard technical conference talk. It's a 25-minute play, basically a one-act. The setting: an office conference room. The characters: a developer, who's written a chunk of new Python code, and a team lead, who's about to review it. You'll see the code. It's not great. What happens if the reviewer waves it through, or lets conflict aversion get the best of them? What if the reviewer says it should be "better" but doesn't articulate how? What if the review is abrasive, or nitpicky, or laid-back? What if the reviewer rewrites the code right there and then? And if we fast-forward to the same team years later, how has this code reviewing style affected the quality and evolution of the codebase, and the team's culture, skill and sustainability? Or, to put it another way, it's Run Lola Run but about code review. I was getting advice about this from a friend who's both an actor-playwright and a senior developer, and I may as well tell you what I told him, about why I want to do this. I have artistic and educational reasons. Artistically: it's frustrating to me that there's such a limited range in how we persuade and teach each other in sessions at technical conferences. Most commonly I see conferences with lots of lectures, panel discussions, and live tool demonstrations. Those aren't very interactive, and so I welcome conferences who bring some variety into the mix on the axis of interactivity, such as hands-on workshops and trainings, and birds-of-a-feather discussion sessions. But also, we could be learning a lot more about spectacle from the giant field of endeavor that is all about entertaining people who are watching you perform on a stage. * We encapsulate wisdom as, e.g., songs and cartoons whose entertainment value helps us value and retain their lessons; Jason and I are interested in seeing how theater can do things a lecture can't do, can be like a demo of behavior, while talking about tech. And educationally: especially when it comes to the emotionally fraught art of code review, the medium of theater seems like a promising way to encourage empathy in the viewer. Code review is a moment of great vulnerability, an opportunity for courage and healthy conflict. We only know ways to be if we can imagine them. Jason and I hope this play illustrates a few ways we can be. So we're preparing that. I hope it goes all right. * No actual stage in the conference room where we'll be performing. But, you know. Figurative stage. # 16 May 2017, 05:56PM: PyCon & WisCon: I just updated my "Talks" page -- I'll be at PyCon May 19-25, to represent Zulip at a booth and then to help run the Zulip development sprint. I will likely also have a new zine to share! And then I'll fly straight from there to Madison for WisCon. I am not on any panels at WisCon this year but I'm the auctioneer for the auction benefiting the Tiptree Award. This year's auction includes a signed first edition hardcover of Octavia Butler's novel Wild Seed, an "Elect Alison Hendrix" pin from Orphan Black, an art print of "Aswang, at Night" by M Sereno, and a bunch more. # 10 May 2017, 09:59AM: OSCON, For a Single Day: I'm going to be at OSCON in Austin, Texas to represent Zulip in the Open Source Alley tomorrow (Thursday) 10am-4:30pm. Please consider coming by and getting a demo, or just talking with us about Python 3, mypy, and how we help new contributors (especially those who have a hard time setting up development environments on their own machines). # 07 Feb 2017, 11:18AM: Upcoming Talks: I happened upon the New York state Assembly's website last week,* and noticed an upcoming hearing about "Government oversight of forensic science laboratories" (PDF), hearing oral testimony by invitation only. I wondered: Who's on the list of witnesses? And will any of them talk about the danger of closed-source, unauditable code used in forensic science in the criminal justice system? I followed up, and we got me, plus Rebecca Wexler, the author of that piece, invited to speak. We're testifying tomorrow, Wednesday, February 8th, in New York City. In preparation, I'm conferring with Karen Sandler of Software Freedom Conservancy (who was slotted to speak but now can't) and with acquaintances who work in government forensic labs. I did speech and debate in high school so in some sense I have been preparing for this for twenty years. Next week, I will participate in the WONTFIX Cabal (Maintainerati) unconference for open source maintainers on February 15, 2017, in San Francisco, California, USA. I will give the closing keynote address at LibrePlanet, a free software conference, March 25-26, 2017, in Cambridge, Massachusetts, USA. Tentative title: "Lessons, Myths, and Lenses: What I Wish I'd Known in 1998." I will be one of the Guests of Honor at Penguicon, an open source and science fiction convention, April 28-30 2017, in Southfield, Michigan, USA. * via Lauren Sperber's blog post about "the New York State Reproductive Health Act to get abortion removed from New York State's Penal Code"
"Man, what a white guy name." "Are you impugning Neil Young? That man sells organic eggs at the farmer's market in my hometown!" "Are you sure they're organic? You sure he doesn't just get them from Sysco?" "Sysco doesn't even sell organic eggs." "Uh, actually Sysco does sell organic eggs." "Yeah right. I bet it's, like, orgänic, with an umlaut, so it can get around the FDA rules on calling things 'organic'." "Yeah, and that's also how they get around the rules on Appellation Contrôlée." "Anyway, Neil Young has a son who really likes model trains, and so he does model train stuff, and he actually has multiple patents related to model trains." "Patents? Is he part of the Open Invention Network? Is this a defensive patent portfolio against Big Train?" In honor of late-night wackiness, I have not actually fact-checked whether Neil Young has any model train patents, or whether he or Sysco sell organic eggs. Caveat lector et caveat emptor. These days, it turns out, OSCON is basically aimed at me! Because I am an executive trying to sell my services (e.g. get hired on an as-needed basis) to engineers and executives who make or depend on open source -- including the passionate ideologues, the burned-out used-to-be-passionate folks, the pragmatists, and all manner of other types. Changeset Consulting was novel, relevant, and interesting to approximately everyone I spoke with. Also, in the intervening five years, I've grown in skill, stature, reputation, and network. So I had something interesting to say, and O'Reilly accepted a talk proposal of mine for the first time. I saw scores of acquaintances, friends, peers, and colleagues in the halls and session rooms this year; I know and am known, which helps me feel at home. I'm grateful to Audra Montenegro at O'Reilly Media for her speaker support. She worked with O'Reilly to cover my flight plus two hotel nights in Austin, making it possible for me to attend OSCON. She and other O'Reilly folks paid and worked with White Coat Captioning to provide CART (live captions) for my talk, at my request. And I was concerned that talking about inessential weirdnesses and inclusivity in open source upped my risk of harassment, so she arranged for some extra security for me. I'm also grateful to Andy Oram, my session chair, for his careful pre-conference prep (including checking on my pronouns -- she/her, thanks! ), and for running a written Q&A session at my request. Opting out of the millimeter-wave scanner at the Austin airport and witnessing a person wearing an EFF shirt not opt out! But here's a conversation that I particularly find stays with me. I was on the expo floor, talking with an acquaintance, and a stranger joined our conversation. I'll anonymize this recollection and call him Cyclopes. He heard about the consulting services I offer, which focus on short-term project management and release management for open source projects and for companies that depend on them -- maintainership-as-a-service, in short. Cyclopes: "Can you come to my company and tell us that the way we're doing deployments is all wrong, and tell them we should do it my way?" Sumana: "Well, if your company hires me, and I assess how you're doing deployments and I think it's wrong, and I agree with the approach you want, then yes." Sumana: [lightheartedly] "So it sounds like what you really want is more a sockpuppet or an actor! Which might be cheaper!" Cyclopes: "Hmmmm! You know, that is kind of what I want!" 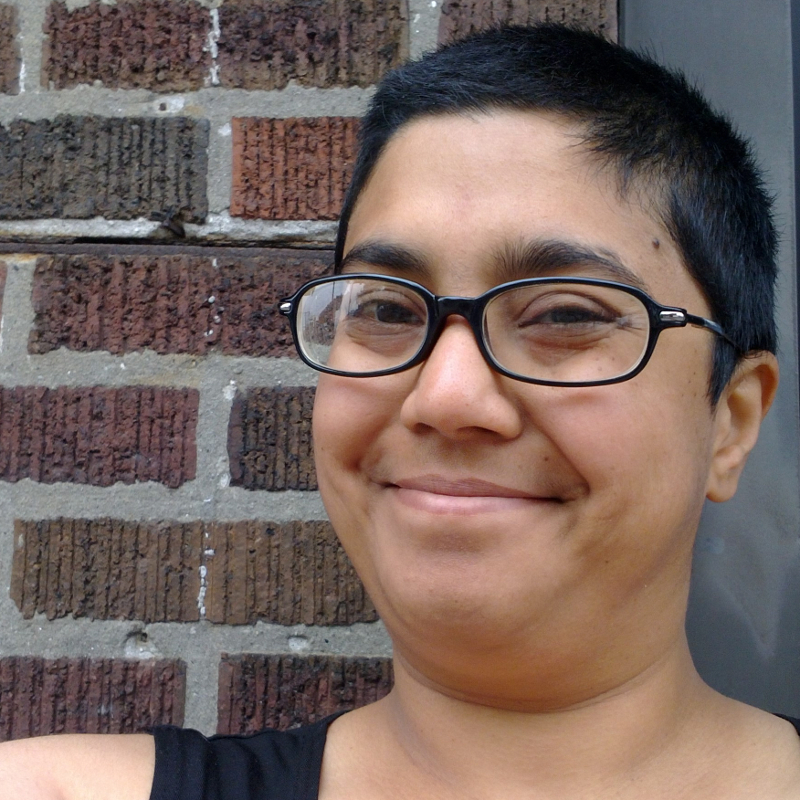 Sumana: "But, in all seriousness, like, you could go aboveboard with this. You know, you have options -- fraud and deception, or actually trying to persuade the other people in your org .... or, this is a wild guess, have you kind of burned bridges by being really abrasive, and now they won't listen to you?" Cyclopes: "Yeaaaaaaaaah that might be what's happened." Sumana: "OK! That totally happens and you weren't the first and you won't be the last." Cyclopes: "Like, I've sent some pretty flame-y emails." Sumana: "Oh man, the emails I've sent. I am so embarrassed when I look back. But you can come back from this. You really can. If you demonstrate to those people in your org that you really want to repair those relationships with them, they will respond. Like, if you say to them, 'I know I burned bridges before, I'm sorry about it, can we talk about this problem,' and you actually try to listen to them about what they need and what their context is, what they're worried about and what problems they're trying to solve, they will work with you, so you can figure out something that works for everybody. There's a book about this, about negotiation, that's a really short, quick read, it helped me a lot: Getting to Yes by Fisher and Ury." Sumana: "There you go, some free consulting for you. It's totally possible." Cyclopes: "I think I could use that, I'm ripe for that kind of personal transformation in my life." Sumana: "Great! Please, seriously, let me know how it works out." Memory is unreliable, but I cannot forget the speed of my diagnosis, nor that this guy literally said that he was ripe for the kind of personal transformation I was prescribing. It's no model train patent but I think I'm happy anyway. # 21 Mar 2016, 05:20PM: Two Conferences, Three Talks: Last week I took the train to Atlanta to speak at the Great Wide Open conference, which I'd never visited before. I particularly appreciated the chance to share my lessons learned with an audience that was diverse on gender, ethnic, speciality, and other dimensions, the cozy and delightful speakers' dinner, and the organizing team's consistent approachability and helpfulness. If Atlanta is an easy trip for you, and if you're interested in growing your skills in free and open source software, I suggest you consider attending next year. I spoke on underappreciated features in HTTP, and my slides are available as a PDF. If you're going to be at PyCon North America in Portland, Oregon this year, I'll be presenting a more Python-specific version of this talk there on May 31st. If neither of those works for you, check out the video of the very similar "HTTP Can Do That?!" presentation I delivered at Open Source Bridge last year. Then I rode the train north to Boston; along the way I got to converse with a neat seatmate, a military veteran who loves taking family walks after dinner to play Ingress with his kids. Awww. His son loves Minecraft so I got to recommend the NYPL historical-map Minecraft worlds to him. Then, this past weekend, I attended my first LibrePlanet. What a lovely time I had! I saw rockin' talks by people whose thoughts I was already eager to hear, and I met dozens of people who are working on promising projects like a nonprofit, transparent search for the web and a browser extension that lets users share their internet connections with people whose connections are censored. I especially commend the organizers for running the conference, including the video streaming, using entirely free and open source software! Since we knew that all of us are dedicated to software freedom as a goal in itself and towards a more just and a freer world, we could have complex conversations that advanced beyond first-contact advocacy and into details and long-term planning. I spoke on "Inessential Weirdnesses in Free Software"; the written remarks I spoke from are now available as a text file. It is not the most legible page in the world, because I will be further revising this talk before presenting it at OSCON in Austin, Texas, on May 18th. I also delivered a somewhat impromptu five-minute lightning talk, "What is maintainership? Or, approaches to filling management skill gaps in free software". I've now posted the textual version of that talk. LibrePlanet participants told me they really liked both my talks; the latter especially spurred some to talk with me about potential contracts with my firm, Changeset Consulting, which was a big morale injection since I'm definitely seeking leads and referrals right now. Thanks to both LibrePlanet and Great Wide Open for having me speak! I've also updated my Talks webpage with links to my upcoming appearances. My calendar's open after August, in case you know anyone looking for a speaker who makes a lot of jokes and gestures. # 21 Jan 2016, 11:00AM: Risk Mitigation: Next week I'm headed to Belgium for my first Free and Open Source Developers' European Meeting. I'll give two talks. I'm excited, because it'll be a chance to listen, learn, influence, introduce myself to potential clients, and see old pals. 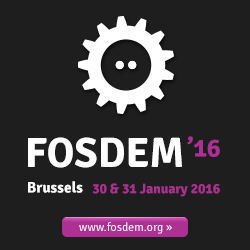 Don't plan to be at FOSDEM; one of these years, maybe after their CoC isn't a joke. Discussion ensued, and in November, the organizers announced their new Code of Conduct. I appreciate that different organizations need to customize their anti-harassment/friendly space/conduct policies, as the Wikimedia technical community did under my leadership, and I recognize that FOSDEM -- entirely volunteer-run, requiring no attendee registration, and charging no admission fee -- has its own particular challenges. But I see why my friend looks askance at FOSDEM's CoC. If you compare it to the example policy offered on the Geek Feminism wiki, you see how lots of little differences add up. For instance, FOSDEM's policy doesn't give a way to anonymously report a problem, and it doesn't suggest how you can find or identify team or staff members. I figure I can go, this time, see how it goes, keep my guard up a bit, and then, as a member with more standing in and a more nuanced understanding of the FOSDEM community, ask for specific improvements, and explain why. My support network, my judgment, and my courage are in good enough shape that I can handle the most likely nonsense without taking too much damage. But there's this one wrinkle. Intoxication (usually drunkeness) both genuinely lowers inhibitions and provides people with an excuse for acting badly even if they genuinely knew better. The data makes me cautious. FOSDEM improved its policy, but not enough to completely reassure me, and we still have yet to see how they implement it. Many individual devrooms and affiliated events, such as the FLOSS metrics meeting where I'm speaking, have added their own CoCs, but that doesn't cover the beer night. So how will I mitigate risk? Maybe I won't go to the beer party at all. Maybe I'll go, but stay in loud crowded places, even if that makes it harder for me to have the kinds of in-depth conversations that lead to sales. Maybe I'll mention my husband a lot and dress androgynously. Maybe I'll mostly talk with women, with other nonwhite people, and with friends I already know, trading off serendipity against safety. And, despite the organizers' suggestion that I "don't miss this great opportunity to taste some of the finest beer in Belgium," and even though I enjoy trying new beers, I'll probably stick to water. Any extended conversation around a code of conduct will eventually demonstrate why a code of conduct is necessary. P.S. I tried to think of an appropriate "free-as-in-beer" joke and could not. Regrets! # 20 Jan 2016, 12:56PM: Several Upcoming Talks: I'm preparing several talks to deliver at open source technology conferences this winter and spring. On Friday, January 29th, at the FLOSS Community Metrics Meeting, I'm presenting "What should we stop doing?" The FLOSS community often clamors for stats that would let us automate emotional labor, so we could focus on more valuable work. Is that appropriate? What if we switched our assumptions around and used our metrics to figure out what we're spending time on more generally, and tried to find low-value programming work we could stop doing? What tools would support this, and what scenarios could play out? On Sunday, January 31st, I'm speaking in the Legal and Policy Issues "devroom" on comparing codes of conduct to copyleft licenses, expanding on the discussion I started in this Crooked Timber piece last year. What can we learn about our own attitudes towards governance when we look at how and whether we make these different freedom tradeoffs? In mid-March, I will present "Hidden Features in HTTP" at Great Wide Open in Atlanta, Georgia. This will be pretty similar to "HTTP Can Do That?! ", which I presented to a standing-room-only crowd at Open Source Bridge last year. If you're a web developer whose knowledge of HTTP verbs ends around GET and POST, expect news, laughs, and lab reports from wacky experiments. Right after Great Wide Open, I'll speak on "Inessential Weirdnesses in Free Software" at LibrePlanet in Boston. And then in mid-May, I'll be presenting "Inessential Weirdnesses in Open Source" at OSCON in Austin, Texas. More than a year after I wrote "Inessential Weirdnesses in Open Source" as a tossed-off blog post, I'm pretty dissatisfied with it. I should have more clearly stated my assumptions and audience, and my intent to play around with some vocabulary and what-ifs; I'm unhappy that many people misread it as a "we should eradicate all these things" manifesto. In these talks I aim to clarify and deepen this material. Open source contributors and leaders who are already comfortable with our norms and jargon will learn how to see their own phrasings and tools as outsiders do, including barriers that often slow down new users and contributors, and to make more hospitable experiences during their outreach efforts. Then in late May I'll make a public appearance or two at WisCon -- the exact nature of which is a surprise! 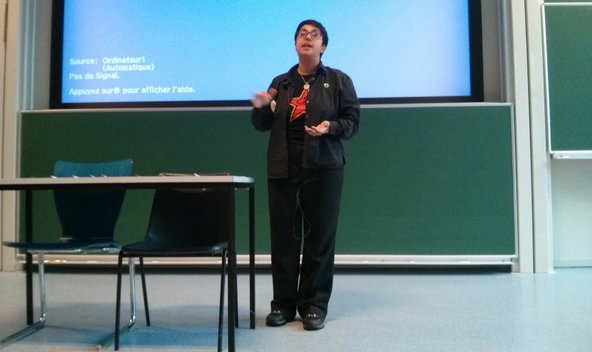 I'm proud that this year I'll be speaking for the first time at FOSDEM, Great Wide Open, LibrePlanet, and OSCON. I hope my talks and the hallway track help me get the word out about Changeset Consulting to potential clients. And if you can't make it to any of those conferences, but you'd like to hear more about Changeset and my other activities, check out Andromeda Yelton's one-hour interview with me in her Open Paren video podcast. At 39:29 I emit a huge belly laugh that makes me happy to re-watch and you might like it too. I try to be intersectional in the media I consume, and sometimes that leads to carbon credit-style bargaining, like, "How many memoirs by trans women of color do I have to read before I go see 'Avengers: Age of Ultron'"? [laughter] And then sometimes there's cheating on that diet, like, "Does 'Mrs. Doubtfire' count?" In this joke, it is not clear enough that the cis ally narrator is completely wrong to categorize "Mrs. Doubtfire" as having anything to do with the goal of reading and supporting trans narratives. I won't make it again and I'm sorry that I made a joke that hurt. For this act I practiced in front of audiences that included trans people, and I asked them for feedback, but I was not thorough enough about checking beyond that for offensive material. In the future I'll be more thorough. Imaginary Book Club, Fri, 4:00-5:15 pm in Conference 2. Five panelists discuss books that don't exist, improvising critiques and responses. I proposed this panel a few years ago (you can see video of its debut) and it has continued, which is cool! Lighthearted Shorthand Sans Fail, Sat, 8:30-9:45 am in Capitol A. What are your go-to phrasings to avoid sexism, ableism, etc. while getting your point across in casual conversation? I hope to walk out of this with some new vocabulary to replace bad habits. Vid Party, Saturday night 9:00 pm-Sun, 3:00 am in room 629. I am premiering a fanvid. Once it's premiered, I'll hit Post on blog posts to announce it publicly as well. Call Out Culture II: Follow-up to the Discussion Held at WisCon 38, Sun, 10:00-11:15 am in Senate A. Meta-discussion around discourse in social justice movements. I predict this session will be pretty intense. Vid Party Discussion, Sun, 1:00-2:15 pm in Assembly. We will discuss some of the vids shown at the vid party, and fan vids in general. This will be the first time I've engaged in public realtime conversation about fanvids. Before this panel I hope to publish some notes about what I learned from watching several vids that drew from multiple sources (including stills), made a political point, or were otherwise particularly ambitious. I'll probably reference those lessons during the panel. I also proposed "What Does Feminist Tech Education Look Like? ", "Impostor Syndrome Training Exercise", and "Entry Level Discussion Group", but am not a panelist or presenter for those sessions; I bet they'll be interesting, though, and you could do worse than to check them out. You can read Entry Level ahead of time for free online. I look like the photo to the left. I am often bad with names, and will remember 5 minutes into our conversation that we had an awesome deep conversation three years prior. I apologize in advance. If you are good at clothes, consider joining me at the Clothing Swap portion of the Gathering on Friday afternoon to help me find pieces that suit me. I'm introducing two old pals to WisCon and spending a lot of time with them (we live in different cities), and they're both white, so I might not be able to come to the People of Color dinner on Friday night. And sadly, The Floomp dance party on Saturday happens during the Vid Party so I probably can't attend that. I did buy a ticket for the Dessert Salon and will attend the Guest of Honor and Tiptree Award speeches on Sunday, and maybe you will be at my table! One of my pals who's coming to WisCon is Beth Lerman, an artist who will be displaying and selling her work in the art show. Check it out! Also I am open to doing a small room performance of my half-hour geeky stand-up comedy routine if several people ask for it. I don't know when or where it would be; Monday night would be easiest. Speak up in comments or some other medium if you'd be interested. # 02 Feb 2014, 08:44AM PST: Foolscap Followup: I'm currently at Foolscap, a hospitable and thoroughly delightful scifi/fantasy convention in the Seattle area. Leonard is a Guest of Honor and I get to be his consort. This year Foolscap takes place in Redmond, which means I am exactly "as lonesome as a Linux user in Redmond," but it turns out that doesn't have to be too lonesome! Jason: Powerpoint Karaoke Best Practices in case you'd like to run that again! Open Source Bridge, which encourages volunteers to help make the conference happen (showing appreciation by giving them free access to the conference), encourages them with a reassuring form, and mentors them with structured orientations. Hacker School, which has a manual including four social rules. WisCon, which has a member assistance fund, very participatory programming creation and signup, and amazing universal access. PyCon has found that specific, personal outreach helps increase diversity. AdaCamp, which also had pretty great accessibility, including a textual description of the space. The Carl Brandon Society, the Outer Alliance, and Broad Universe are examples of organizations working on diversity in speculative fiction & fandom whom you might invite to host a reading or party at your con. I think most of you already know about the Geek Feminism anti-harassment policy resources. "You, Yes You, Can Do Standup Comedy", the exercise I led. You can read more about that HOWTO in "Manufacturing Consent To Laugh" and "HOWTO Write Hackish Standup, Part II". In general, my Reading category of blog posts, in case you want to see what I've been reading. Includes occasional links to my Archive of Our Own bookmarks of great fanfic. Dave: Ancillary Justice by Ann Leckie, the amazing book that most recently blew my head off. It's about power and institutions, about the lived difference between true mutual aid and imperialism. And it's a space adventure with fights. So great. Frances: I know you'd heard of OpenHatch but you might not have seen the OpenHatch Events list which in my opinion you should be on. Here's Software Carpentry, the organization bringing programming and software engineering lessons to researchers. Frances: I think right now my favorite authors are Zen Cho, Jo Walton, and Maureen McHugh. My ideal story might be about insurance fraud in space, possibly involving Quakers, cowritten by these three. Stuff I say on Geek Feminism, on Twitter, on the Wikimedia Foundation blog. From the Potlatch party last night: A Prairie Home Companion, Garrison Keillor's radio show that Leonard and I both listened to while growing up. # 19 Jan 2014, 04:51PM: Interesting-Looking Talks at PyCon 2014: This year I'm going to visit PyCon! In fact, I'm presenting a poster: "What Hacker School Taught Me About Community Mentoring". You should register soon if you're coming, especially to take advantage of heavily subsidized childcare or to register for one of the tutorials. Someone on one of my mailing lists asked what sessions people are particularly looking forward to. I tend to follow Skud's conference tips, which mean skipping sessions when I need to do self-care. But with such great-sounding talks, I may not be able to pull myself away! Allison Kaptur's "Import-ant decisions". Kaptur is a facilitator at Hacker School and I enjoy her thinking process, areas of interest, and speaking style. I know I'll learn more about package management in general, and about Python specifically, from this talk. Jessica McKellar's "Building & breaking a Python Sandbox". McKellar did a residency in my Hacker School batch during which I got to see a preview of this talk, so I may not go again, but I found it thought-provoking; it helped me understand how Python works in a new way. Erik Rose's "Designing Poetic APIs". I met Erik Rose at a Google Summer of Code Mentor Summit and thought he was a really smart and fun guy. I've never designed an API before (thus I also want to go to the novice-focused "So You Want to Build an API?" by Megan Speir), and I like that his discussion will include anthroplogy, psychology, and history. Nathan Yergler's "In Depth PDB". I am one of the programmers the speaker sadly mentions; I rarely use it, if at all, even though it would be great to help me see when and why things are breaking! A localisation talk, maybe this one, because I think the Python application I'm working with right now just has hardcoded strings (aiee, bad). One of the SQLAlchemy talks, maybe this one, because I don't grok how to use SQLAlchemy yet. However I have registered for the SQLAlchemy in-depth tutorial so one may duplicate the other. Julia Evans's "Diving into Open Data with IPython Notebook & Pandas". I enjoy Julia Evans's investigation process and her speaking and writing style. (See my post "Why Julia Evans's Blog Is So Great".) I have never used IPython Notebook nor matplotlib, numpy, pandas, or any of the other awesome science/data-related Python tools, and keep meaning to; this talk should help me with that. Greg Wilson's "Software Carpetry: Lessons Learned". I am a tremendous fan of Wilson's work - Software Carpentry, the books he's edited, etc. The SC crowd has collected a lot of data (e.g. surveys of learners at their bootcamps) and I will probably want to soak in their lessons learned and shout about them to every other teach-y group I'm in. Naomi Ceder's "Farewell and Welcome Home: Python in Two Genders". 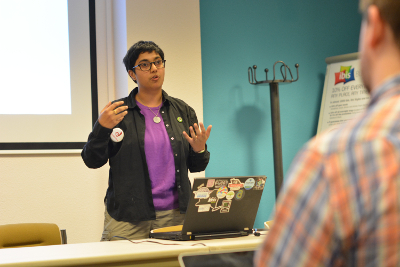 I want to learn more about the experiences of trans women in my open source communities. Kate Heddleston, Nicole Zuckerman, presenting "Technical on-boarding, training, and mentoring". I do this task in my open source communities so I want to learn more best practices.